This is part 2 of our Holiday Gift Guide. See part 1 here, all about ideas for BBQ, Grilling, and general foodies on your list. 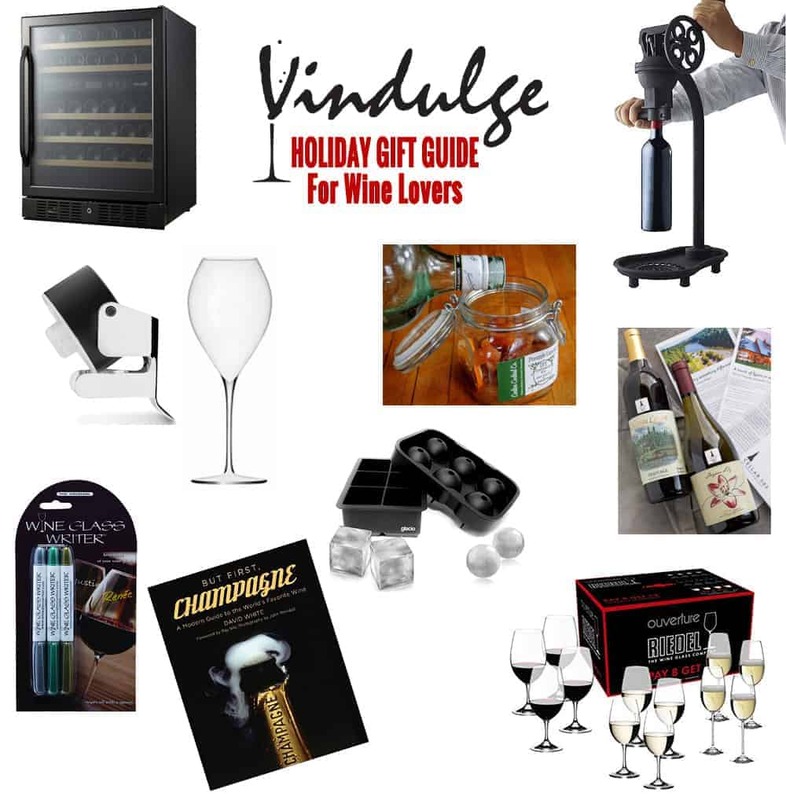 In part 1 I discuss my love/hate relationship with most gift guides and why we narrow it to 10 in each category, and why when it comes to our favorite wine related products, we keep it simple. That being said, these are our 10 suggestions for the wine lover on your list this year. A few of these contain affiliate links. But honestly, this year most of them are not. They’re just items we love and use or think are super cool and would love to own. We have the full review of this wine fridge coming up in the next week or two. But I wanted to mention it now in case you’re in the market for a quality wine fridge, because they are having a site-wide sale today. This one comes in two sizes (29 bottle or 46), is well-built, super quiet, and has 2 temperature zones (so you can keep your red wines and white wines at different temperatures). We’ve gone through several wine fridges over the last 20 years and this one is by far the most well built that we’ve had. We’ve only been using it a few weeks, but so far my observations are that it’s super solid. Full review coming soon. But if you shop today you can take advantage of their site-wide sale! Shop here. There are two basic styles of wine clubs — winery specific wine clubs and those who curate wines from different producers. We’ve been a part of several, and have the full reviews of these two clubs coming soon, but these two are the ones we recommend this year. *Note that if you find a specific winery and you love all of their wines, then inquire about their club. Every winery has a different club (with different rules, prices, events, etc.). Two recent wine clubs we recommend are Cellar 503 and Plonk (both are curated wine clubs, not single producer clubs). I like them both for different reasons (again full review coming soon). Cellar 503 is for the Oregon Wine Lover. The wines are selected from all over the state, and all from small batch producers (most of them make less than 2,000 cases per year). If you want to explore some exciting wines from Oregon, this is a great club to try. ***For Cyber Monday they are giving you your first month for $1! That’s a fantastic deal. Plonk Wine Club curates a wide selection of boutique wines from the different regions throughout the world. You’ll receive rare and unique wines, natural wines, organic and biodynamic grown wines. There are several options to choose from and there is no membership fees required. Find out more here and stay tuned for our full review (though we mention it now because we really enjoy this club and do recommend it). Find out more here. Good stems are a must in my house. I’m no snob, but they truly help with the enjoyment of whatever it is I’m drinking. I try to keep my stems basic and have a style for sparkling wine/Champagne, one for white wines, and one for reds. If you’re really into wine it may help to have two styles of red wine glasses (a standard Burgundy stem and a Bordeaux stem). Riedel is pretty widely available and solid, both in reputation and quality. Most of our wine stems are Riedel. This looks like a great starter set. It comes with 4 Champagne, 4 white, and 4 red stems, sold at a great price for this brand. Find it here. But if you’ve been following my Friday Instagram sparkling wine posts you’ll notice they are unique. My stems are the Lehmann “Jamesse Prestige” Grand Champagne glasses. I’m seeing a few online from different sources. Here’s one place to find them. I received this book for Christmas last year and loved every page of it. It’s a fantastic look at the history of my absolute favorite beverage, along with how it’s made, some of the best producers, and so much more. This is a must for any Champagne lovers in your life. Find it here. I’ve gone through dozens of different kinds of Champagne stoppers and these are super solid and super cheap. They keep your bubbles crisp in the bottle and don’t let extra air in the bottle which would allow those bubbles to dissipate too quickly (unlike cheaper versions of this). A great stocking stuffer for the bubbly lover on your list. Find them here. This is another fun stocking stuffer. We’ve been using our wine pens a lot lately as we entertain guests. Instead of wine charms (where it’s easy to forget which wine charm you chose) why not write your name or a fun picture on the glass. The “ink” comes off super easy by running some warm water and a sponge over the stem. Awesome host gift for parties or general stocking stuffer. My kids love to use these on their (non-wine) glasses as well. Find them here. This looks so cool! For our first house we received a similar corkscrew as a housewarming gift from my best friend. It’s long gone now, but this really reminds me of it. And it’s friggin’ cast iron, which is so badass and means it will probably last a very long time. If you have that someone on your list who loves wine and would love a cool accessory like this (like me, hi! ), and you want to spoil them with a cool gift, this one might be it. Find it here. This is becoming one of my family’s go-to gifts for a host or cocktail lover. These infusion kits, made by the local Carlton, Oregon, based company has infusion kits of various kinds. They come with a (re-usable) 30 oz glass Filo bale jar w/all of the dry infusion ingredients you need to make your choice of the drink (see the options here). All you need to do is add the booze. This and a bottle of bourbon (or rum if you’re my sister), gin, or even vodka, make for a perfect host gift. My family’s favorite is the Pineapple liquor. The Rock & Rye is pretty badass too. Shop here. You gotta have cool ice cubes if you’re to make a great cocktail, right?! Well, no, not really. But these are pretty cool! We were asked a ton of questions after we produced this cocktail video as to where we got our ice molds. We have several kinds, including these large ones as seen in the video. But these (in the photo above) are more practical for everyday cocktails. They make a great stocking stuffer for any cocktail lover on your list. This is a 2-pack that has both cubes and round balls. We have both. Check it out here. A few (less than half) of these contain affiliate links. Please know we only recommend items we love and use often, and everything on this list is items we stand by. Happy Holidays!